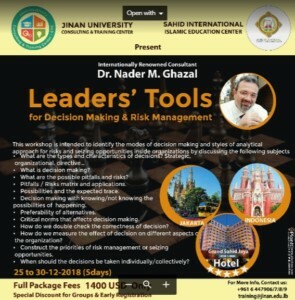 The Center of Consulting, Training, and Languages at Jinan University, in cooperation with the Indonesian Sahid Group, is proud to invite you to participate in our highly specialized training program entitled: *”Leaders’ Tools in Decision Making and Risk Management”*. This training program is addressed to executives and business owners, as well as decision makers in private and public sectors institutions. The venue is in Shahid Plaza hotel, Jakarta, Indonesia, from December 25 to 30, 2018. For inquiries and participation, please contact us at: +9616447906- +9616447907- +9613034610 WhatsApp only.